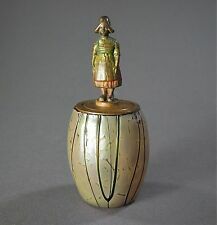 For your consideration is a rare Czech or Austrian Lidded KRALIK Glass Brush Jar with a Cold Painted Bronze Dutch Girl Finial, circa 1900. The glass has a gold/brown, oil spotted papillon-type ground with tiny vertical, dark purple/ruby veining. 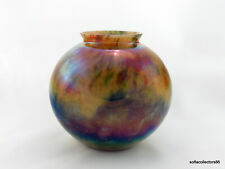 This is a vase by Kralik in the very colorful iridescent Cased Powder décor. The vase is marked on the base with the semi circular Czechoslovakia mark containing the split o's. The etched mark on this vase was in use by Kralik between 1919 - 1933. The vase wiggles when touched as the bottom is not perfectly flat and has that hand blown appearance. These scratches do not show when properly displayed and do not take away from the value. The piece has a counter sunk Polished Pontil, the mark of quality piece of art glass. Kralik Bohemian Blue on Gold glass vase. As you turn vase, you can see shades of purple and red. Glass nobs on vase. Top of vase is slit in half and rolled outward. The bottom is round like a bulb. This Vase is in excellent condition. It stands approx 12" tall and 6" wide. So the item you see is the item youwill receive. This is a beautiful iridescent vase in a floral shape. The color of the vase is an off-white Mother of Pearl. The bottom has a web-like texture. The piece was made by Kralik and is in the Mother of Pearl series. Both handles are also mint. I believe the maker is Kralik but I have not been able to find the form. It is 6 1/2” tall and 5” wide. A very pretty vase in pristine condition. Hand blown, the aqua blue taper glass vase has a horizontal deco wave design with vertical corner panels. Unsigned, the vase closely resembles early 20th century Loetz, Kralik or Moser. Aqua Blue Ribbed Spatter Glass Vase. A fine Kralik art glass vase in green glatt gold tri-claw, circa 1900. This is a heavy piece with a nice polished pontil. 6 1/2" wide. In excellent condition. There may be a chip right on the pontil. So the item you see is the item youwill receive. This great hand blown vase has beautiful design and pearlescent satin finish ~ Made in Czechoslovakia with High Style Design of the Deco Period. at opening x 6 3/4" Dia. at widest x 4 1/4" Dia. UNIQUE BOHEMIAN?. ART GLASS FLORIFORM VASE. KRALIK or HARRACH?. Want more pictures?. Let us know. There will be NO HANDLING FEE. WHAT U SEE IS WHAT YOU GET. INTERNATIONAL SALES. This great hand blown vase or compote has a beautiful bullet or rocket shape design and great iridescent over the green ribbed & verre de soie glass ~ Made in Czechoslovakia with High Style Design of the Art Deco Period. This great hand blown vase has beautiful design and pearlescent satin finish ~ Made in Czechoslovakia with High Style Design of the Deco Period. x 3 3/4" Dia. at opening x 5 1/2" Dia. at widest x 4" Dia. The date is circa 1900. This beautiful 5" Vase has the distinctive Kralik iridescense, beginning at the bottom in a rose pink color, slowly changing to green in the upper portion. The result is a swirling at the neck and a flared mouth. The bowl has a beautiful iridescent glass body with verre de soie finish with a faint ribbed appearance on a frosted translucent body. There are two green tadpoles which begin at the widest area of the body and extend to the base of the vase. Along these areas, there are a couple discolored areas. Small imperfections to the finish that you need to look for otherwise it is not noticeable. I am very picky. It is a pretty piece of iridescent Kralik Teardrop. It is 6 1/4" tall. By the end of his life Kralik had 7 Glassworks. This pattern is known as the fish scale pattern and has a Bohemian Iridescent blue, purple, green, ruby red color. These pieces are very beautiful as seen in these photos. Gorgeous hand blown vintage antique 1920s~30s Czech Glass Art Deco Spatter Vase in bright two tone orange and deep green that’s full of sparkling aventurine. Etched “ Czechoslovakia “ on the bottom Measures 6.75” tall condition is excellent Shipped with USPS Priority Mail. A beautiful marbled art glass vase, made by Kralik in the Art Deco period around 1925. Wilhelm Kralik & Sohn, Eleonorenhain, Bohemia. weight: ca. 440 gr. Condition : Very good to excellent. One tiny factory flaw under the fold pictured in the last picture. The vase has a polished top rim and no pontil mark on the bottom. This pattern line was simply known as "Applied Fruit". This is the largest Kralik applied fruit vase I have ever owned and seen in my 43 years as a collector and dealer. LARGE KRALIK BOHEMIAN GOLD PINK IRIDESCENT ART NOUVEAU GLASS VASE. THIS IS AN EXCEPTIONAL PERIOD KRALIK BOHEMIAN ART NOUVEAU GLASS VASE. SUPERB IRIDESCENT GOLDEN APRICOT WITH HIGHLIGHTS OF PINK, GREEN, BLUE, AND GOLD. A beautiful marbled art glass vase, made by Kralik in the Art Deco period around 1925. Wilhelm Kralik & Sohn, Eleonorenhain, Bohemia. weight: ca. 278 gr. In excellent condition- 6” tall cylinder vase- white carnival Iridescent ribbed background with fabulous applied IridescentBRIGHT GREEN Stems & leaves- contrasting deep purple plums. The vase has a beautiful green iridescent glass body with shades of brown and hints of yellow and blue. No pontil, unmarked. In very nice condition, the glass is fairly thick. We do not know the history of them or the path they have traveled. ~ The last 2 photos are for Reference only. The second is also a known Kralik example with the fluted cobalt base and applied leaves very similar to the one listed here. 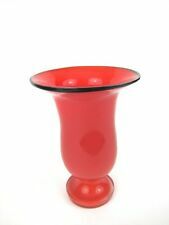 ~ Tango Glass with Red Ground Color is referred to as Red, but it’s truly more of a Red-Orange. KRALIK WHITE OPALESCENT MOTHER OF PEARL IRIDESCENT. THIS IS AN EXCEPTIONAL PERIOD KRALIK BOHEMIAN ART NOUVEAU GLASS VASE. STUNNING CASED GLASS WITH OUTSTANDING OPALESCENT PINKISH IRIDESCENCE. ART NOUVEAU GLASS VASE. We have had it for 30 years, bought from a person who has it for 20 before that, estate sale in NYC early 1970's. Rare style, piece, very unique series, size, colors, make. Very beautiful, even feels good in hands, smooth & fine. This overshot art glass vase was made by Kralik as part of their Silveria line. It has an approx. 2" crack on one side it. It is still a great piece for display. If you turn the crack to the back side no one will know it is there. KRALIK ART NOUVEAU MOTHER OF PEARL HYACINTH VASE, EARLY 1900'S. Shape was designed for hyacinth bulb. Bohemian mother-of-pearl glass vase, from the late 19th centuryArt Nouveau period. For your consideration is an Original Art Nouveau Early 20th Century Art Glass Vase attributed to The Kralik Glassworks, Wilhelm Kralik Sohne in the Lovely Harlequin Opalescent design. This rare and highly collectible Bohemian art vase is superbly hand crafted, the body is a soft opalescent with gorgeous harlequin glass marbled into the lower surface ascending from the base. X 2 1/4" Dia. at opening x 5 1/2" Overall Dia. Check the Kralik-glass website for details on this shape. This stunning vessel is superbly crafted in a beautiful hand blown, hand crafted glass with magnificent green bronze coloring and a gorgeous luminous iridescent finish that changes color depending on the light source. For your consideration is a fine antique Bohemian Art Nouveau hand/mold blown art glass vase dating to the early twentiethcentury. A fantastic piece and extraordinary example of Bohemian art glass at its finest production. This stunning vessel is superbly crafted in green glass with magnificent peacock colors, featuring the unique "Swirl"décor pattern design.This fantastic vase displays beautifully! I have seen this style attributed to Loetz, however, I believe it to be a Kralik piece. I almost missed it as it is that small. The vase has a polished top rim and a large counter sunk pontil mark on the bottom. This is the finishing sign of a quality piece of art glass. This candlestick vase made circa 1920-1925. The maker was Kralik and it is signed with the half circle mark. 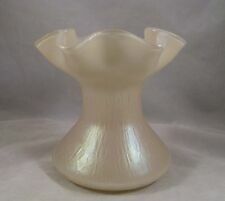 It is hand blown with a polished pontil and is 10 1/2” tall and 7” at the widest point. A very pretty vase. Gorgeous Antique Gold Red Threaded Glass Hand Blown Huge Bowl Kralik Konig 13"
This is a gorgeous late 19th century Victorian era hand blown threaded art glass very large center piece bowl. It is a Bohemian art glass piece. It is a hand blown art glass with polished pontil as shown. This mainly Blue and pink, round footed vase by Kralik is in excellent condition with minor fleabites on the inner rim and is marked underneath with an early straight CZECHOSLOVAKIA mark commonly seen on Kralik Glass. This 8 3/4" tall TANGO RED with mainly Yellow and blue pulled spatter is not stamped but we have a matching decor candleholder that has a straight-line CZECHOSLOVAKIA mark. This rare pair of overall multi-colored confetti bohemian vases are both stamped with a straight-line CZECHOSLOVAKIA mark. They are probably KRALIK but the inner licorice colour also suggests a WELZ provenance. It has a flat, polished rim. This vase was made by Kralik. The technique is known as "caged" and the color pattern is known as "powders.". It has an acid-etched "CZECHOSLOVAKIA" mark beneath. It has light wear.